​Manisha Shrestha and Poonam Maharajan are lead teachers at the two preschools HIO funds—Bal Kendra and Strong Roots. They are the kind of teachers any parent would dream of having for their child. Manisha and Poonam work tirelessly to educate students living in some of the most dire conditions inner-city Kathmandu has to offer. They are forward-thinking and compassionate educators who embrace new ways of teaching and learning. Being fully committed to improving their practice, they serve as role models for other teachers throughout the Kathmandu valley. HIO is raising $4,700 to support a unique travel and training opportunity in April 2019 for these two remarkable women. The HIO Education Committee recognizes that Manisha and Poonam have great potential for bringing about real and lasting change in Nepal. Laura Gladding, Moses Brown Lower School Librarian, and Laura Hunt, The Croft School Founding Teacher, have worked extensively with Manisha and Poonam over the past two years on-site in Nepal and through HIO’s long distance learning program. The Lauras will create a robust training schedule for the Nepali teachers’ U.S. visit to Providence, RI. It will include classroom observations and opportunities for Manisha and Poonam to exercise their English language skills teaching students other than their own. Their U.S. visit will facilitate a rich exchange of ideas about teaching and learning and foster greater cultural understanding. 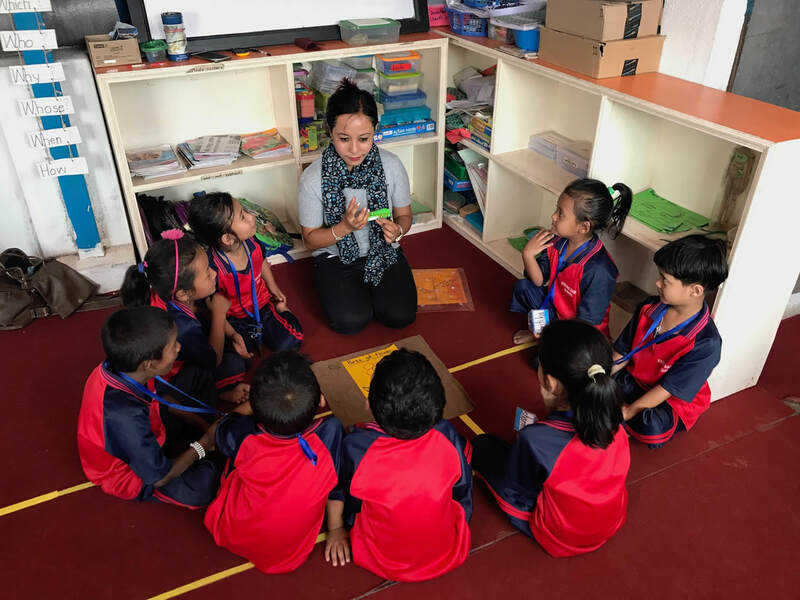 Your donation to She Dreams of the Future will help create a life-changing experience for two wonderfully committed Nepali teachers and their students. With your generous support, Manisha and Poonam may continue their journey toward fulfilling their dream—offering the best foundational education imaginable to help poor Nepali girls and women lift themselves from an endless cycle of poverty. Manisha Shrestha teaching Bal Kendra students how to speak in English. Poonam Maharjan teaching Strong Roots School students how to read in English.